If you’ve ever traveled with me or have followed me on the blog for awhile, you probably know that drinking water is not something I do very often. I drink water when I run, of course, and when I work out, but I haven’t been able to make it a habit to drink several glasses of water daily. I did make a real effort to drink plenty of water years ago when training for my first half-marathon, and found I was frustrated with being in the bathroom all the time. And I noticed that when I stopped guzzling water, my running didn’t seem to be affected, so I stopped drinking it as often (and interestingly, more recent research challenges how much fluid we actually need). One thing I have been able to do when it comes to hydration is swap out some of the juice and a lot of the soft drinks (I used to consume a half a can daily and now I don’t usually have any in my fridge) and I’ve replaced it with flavoured sparkling water. 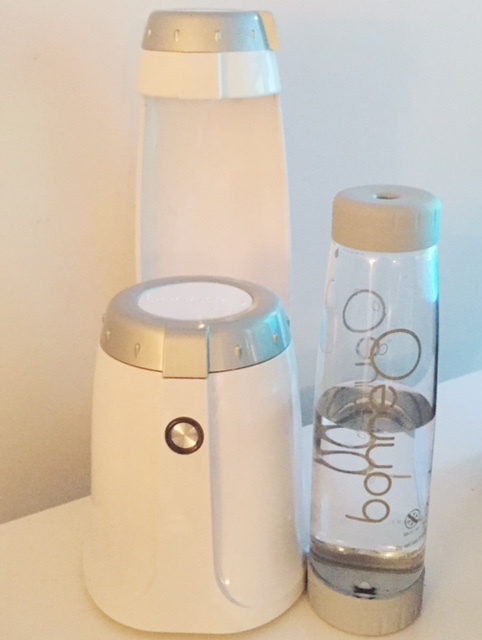 As you may recall, I tried out Sodastream last year to help me do this, and I was super curious about Bonne O, another at-home machine to make your water bubbly so when this Canadian company asked me to try out their sparkling beverage system, I told them I was in as long as I could share my honest review to which Bonne O said of course. So, how’s it measure up? My first reaction to the actual Bonne O machine itself is that it’s not very sleek or modern looking. Compared to the modern look of my Sodastream Power, the white machine and overall shape is much less appealing to me than the boxy and more compact shape of the Sodastream Power I have (besides aesthetics, I need kitchen gadgets that take up the least amount of space in my small kitchen, and I feel like Bonne O takes up more counter space). Bonne O’s major difference, in my opinion, is the carbonators. What are these mysterious little white pucks that somehow make water bubbly? Instead of the usual heavy canisters of compressed CO2 (the kind you use with Sodastream), Bonne O uses small round pucks, which are made of food-grade materials (think citric acid and sodium bicarbonate) that react with water to create CO2 gas. Another thing that sets Bonne O apart is you can use it to carbonate lots of different beverages and ingredients. With Sodastream, you’re carbonating water and adding fruit or syrup. But with Bonne O, you can make fruit infusions so that flavours are incorporated during the sparkling process. And, people, you can sparkle wine or your favourite cocktail! Whaaaat. I could get behind some sparkling white wine on a hot summer night! 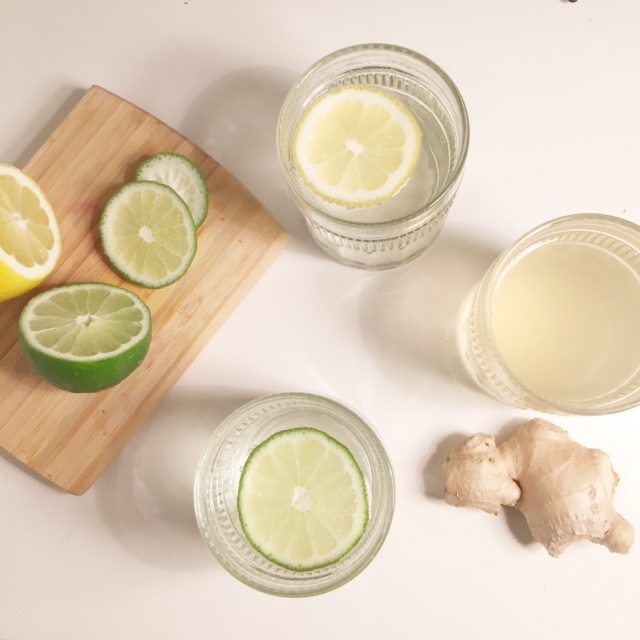 That said, because I go through phases, lately I’m focusing less on what I’m drinking (my juicer hasn’t been used in while…) and focusing more on cooking, so I’ve been using the Bonne O mostly to drink sparkling water really simply with lemon or lime. But I did whip up some ginger syrup as the Bonne O 100 Sparkling Creations book that comes with the unit inspired me to try the recipe. And the result is delicious, and I like the idea that I’m making my pop from scratch. So which machine do I prefer? I found that Bonne O, using one carbonation puck, results in exactly the level of bubbliness I enjoy (N.B. You can use half a Bonne O carbonator if you prefer less bubbles). My Sodastream Power, while it offers three levels of carbonation, I found that the results weren’t consistent (I sometimes selected the highest carbonation twice to get a decent amount of bubbles, but sometimes I’d end up with great bubbliness and sometimes less so). It’s the carbonators that are, in my opinion, the major advantage to the Bonne O system. With my small kitchen’s limited storage and no car to do grocery shopping, I really dislike buying, storing and and returning the CO2 tanks. The carbonators in comparison are lightweight and are in a compact box, and this is what’s won me over. The only thing I feel Bonne O comes in second on is its design, as I mentioned above. Sodastream Power is a much sexier looking machine. If choosing between the two machines, I personally think it boils down to the CO2 tanks vs carbonators and the machine’s design, as I find the actual beverage results pretty comparable if you’re planning on carbonating water (if you’re keen on carbonating wine and other drinks then, of course, Bonne O is the way to go). And what about that giveaway I mentioned?! CONGRATS TO SHAMARRA G., the winner of her own Bonne O! Thank you to everyone who entered! INSTAGRAM: Follow me on Instagram (@healthandswellness), and comment on the photo related to this giveaway — tell me what beverage you’d use the Bonne O to make. Would you add a certain fruit? A cocktail? Herbs? FACEBOOK: “Like” the Health and Swellness Facebook page, and reply on the photo on the page — tell me how much water you drink daily. I’d love to hear what everyone’s hydration habits are! This giveaway is open until 11:59 p.m. EST on Tuesday, March 21, 2017. The winner will be chosen at random on March 22, 2017 and contacted via the method they’ve entered to provide their shipping address and contact info. Thanks, good luck and happy hydrating! Contrary to what you imply, you can make cocktails and carbonate wine etc with a sodastream. So not sure the advantage. I rarely buy Sodastream Syrups. I make my own, better, beverages from scratch most of the time. This Bonne O apparently has the same business model as the coffee pods. ie make money on the “carbonators” and fill the landfill with plastic from used carbonators. I’d much rather use a system that is truly refillable. Less garbage in the landfill and cheaper to use.